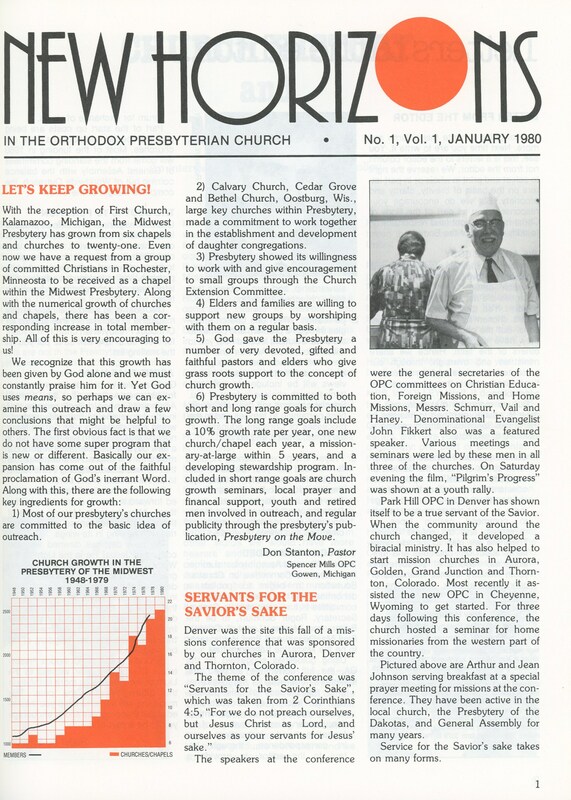 Arthur Johnson, who served as a ruling elder in the Orthodox Presbyterian Church for over sixty years, died at the age of 100 on April 18, 2006. He and his wife, Jean, were pictured serving breakfast on the front page of the first issue of New Horizons magazine in January 1980. This is just how one might have expected them to be pictured, for they were known for their hospitality. Whether they were living in their house on Gaylord Street in Denver, with their six children, or in their condominium on Pearl Street, food and lodging were always available for presbyters, committee men, friends, and strangers who visited the Park Hill Church. Mr. Johnson was active in the Presbytery of the Dakotas and at the General Assembly, and up until his nineties in the local church.